This is a highly intriguing disc that confirms the high standard prevalent in the Iberian Peninsula with regards to the choral repertoire. Not only is the generation of '1927' well represented but there are a host of composers which hail from earlier, more Republican times. 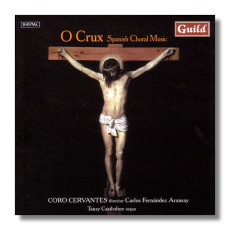 The subject is centred on Christ's crucifixion and the music on offer is stunningly sung by the CoroCervantes who obviously are very much at one with this style. Composers such as Sor, Breton, Barbieri and Goicoichea may be rather unfamiliar names but one need not expect any lowering of standards, notwithstanding the deep, almost fanatic religious faith that tends to fill the pieces with some bias. If pressed to choose for a particular favourite, Juan Arriaga's 'O salutaris' would perhaps take the cake. There are nineteen pieces in all and as such, this could be taken as an important sample of sacred music from the mystical and wonderful land of Spain.